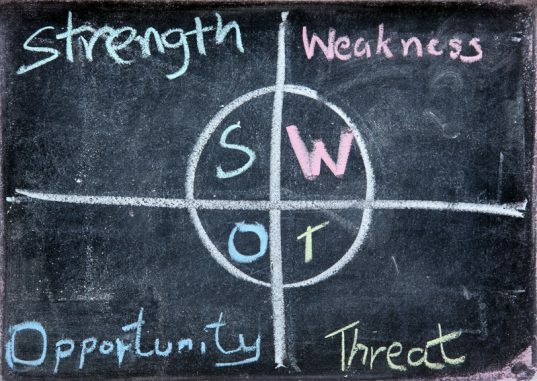 Many organizations utilize a SWOT analysis to identify organizational strengths and weaknesses. SWOT analyses can be interesting, but what should you do with the resulting information? This is where the TOWS matrix becomes a useful tool. It is a simple but effective way to brainstorm specific strategies to address the results of your initial SWOT investigation. You’ve probably noticed that TOWS is simply SWOT spelled backwards. Remember from our last article that these letters are just an acronym for Strengths, Weaknesses, Opportunities, and Threats. For the TOWS matrix, simply create a chart where your internal pieces (Strengths and Weaknesses) intersect with the external aspects (Opportunities and Threats). The graph below shows an example of how your table should look. Now that your matrix has been created, it’s time to put your brain to work and come up with some strategies. Remember, the point is to come up with many ideas for each box. Since you’ll have lots of strengths, opportunities, etc. listed, there’s plenty of fodder to come up with multiple solutions. Here is a more detailed description of each section. SO (Strengths-Opportunities) – Use internal strengths to capitalize on external opportunities. For example, if you have a person or committee that is adept at writing grant proposals and there is a lot of grant money available, then a strategy may be to devote more focus to this area. WO (Weaknesses-Opportunities) – Improve internal weaknesses by using external opportunities. Using the grant writing example again, suppose your agency hasn’t had success in this area. That’s a weakness, but are there opportunities to gain access to these grant monies? You could hire an expert or consultant. You could outsource the whole project. Perhaps you decide to send a staff member to various training and seminars so he or she can become your own in-house expert. ST (Strengths-Threats) – Use internal strengths to avoid external threats. Suppose there is a threat of funding decreasing dramatically in your service area. What are your organization’s strengths that can help? Do you have deeper pockets to simply weather the storm? Maybe you are more efficient than other agencies in your area. For many nonprofits, utilizing a volunteer management software like VolunteerHub can also serve as a strategic advantage to become more efficient and effective. WT (Weaknesses-Threats) – This is definitely the most defensive position on the TOWS matrix. The strategies created here will want to avoid threats and minimize weaknesses. It is most often used when an organization is in a bad position. For example, perhaps an agency isn’t as efficient as stakeholders expect, and there is the threat of losing funding. In this case it might make sense to merge some programs with another organization to leverage resources better and ultimately hang on to funding. As you can see, the TOWS matrix is a fairly simple tool to use. The reason so many business strategists use it isn’t based on its academic merits but rather that it gets conversations started. The real secret to this approach is the fact that it gets everyone on the same page and focusing on the same issues. If your nonprofit is not using the TOWS Matrix for setting volunteer management goals today may be a great day to start. Want to learn more about SWOT analyses? Read our article about building a rock-solid SWOT. Thanks a lot. Your approach is simple and effective and I benefited a lot. Thanks again and regards. This taught me something new. Brilliant staff – very helpful. Thank you.